Donating blood is amazing. Don't get me wrong, it isn't for everyone and that is absolutely fine. Maybe you are terrified of needles, or you have a health condition that prevents you from donating. 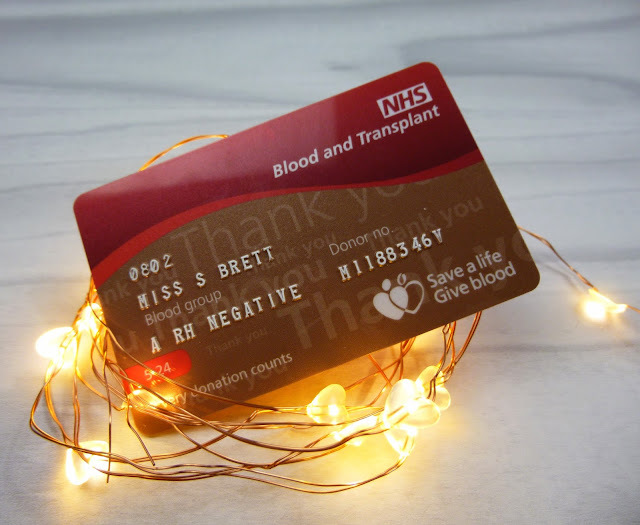 I'm not here to lecture or shame you, but if you are interested in giving blood and just haven't gotten around to it yet, here are five simple reasons you should book your appointment today. 1. It's super easy and painless. On average, after filling out the paperwork and having my iron levels tested (which is the worst part of it in my eyes), it takes me about ten minutes to donate a full bag. The nurses in my local donation centre are lovely, and make sure that I'm not in there any longer than I need to be. They make sure everyone is comfortable, and are reassuring to anyone who is a little nervous. If you're nervous about donating for the first time, you're not the first person! They've seen it all, and they're absolute pros. 2. People need blood every day. I can't even imagine being in a situation where I needed a blood transfusion. The NHS have recently started sending text messages to let you know when and where your donation has been used, and I find that to be an amazing touch. I got so emotional when I got a message to say that my donation had been used in Westmoreland General Hospital in Morecambe, and I couldn't help but think about the people needing it. What were they going through? It was incredible to think that only ten minutes of my time was helping them out in potentially their darkest hour. Your body makes almost Two Million new red blood cells a second. So damn girl, share them! Do I really need to say more? If you're really lucky, sometimes they even have mini cheddars! Seriously though, don't forget to sit down for a few minutes and have a glass of water after you donate. Blood is an incredible gift to give - the gift of life. Your donation could be the difference between life and death for someone. Your choice to donate could save a life. If you want to register as a blood donor in the U.K. either call 0330 123 23 23, visit Blood.co.uk or pop in to your local donation centre! Have you ever donated blood? Tell me about your experiences!